Freed Al-Jazeera Journalist Looks Forward To 'The Little Things' : The Two-Way Australian Peter Greste, who spent more than a year in an Egyptian prison, was freed on Sunday. He says he remains concerned about his still-jailed Al-Jazeera colleagues. 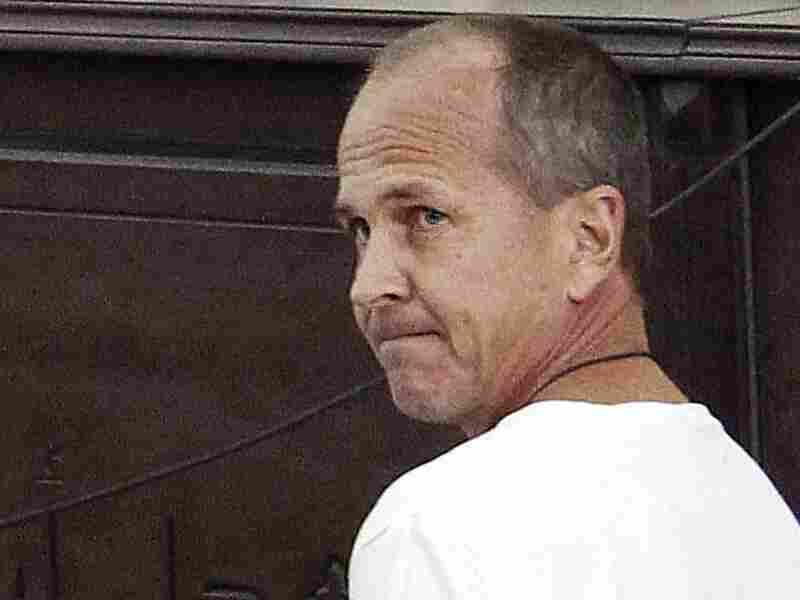 Al-Jazeera English correspondent Peter Greste, appears in court March 31, 2014, along with several other defendants during their trial on terrorism charges in Cairo, Egypt. Peter Greste went out for a run at his Egyptian prison Sunday when the warden called him over. He "told me that, you know, it's time to pack your stuff," Greste, an Australian who spent more than a year in an Egyptian prison, told his employer, Al-Jazeera. "I said, 'What do you mean?' He said, 'You're going.' I said, 'Well, where? To another prison?' He said, 'No, no, no. The embassy is coming. They'll be here in an hour. Get your stuff and go.' "
That's how Greste learned that he would be returning home to Australia. Greste and fellow Al-Jazeera journalists Mohamed Fahmy and Baher Mohamed were detained in December 2013 and imprisoned in June 2014. They were convicted on terrorism charges and accused of aiding or being members of the now-banned Muslim Brotherhood. Fahmy, who holds dual Canadian-Egyptian citizenship, and Mohamed remain in prison. NPR's Leila Fadel reported Sunday that Fahmy has also applied for deportation under a new law that allows foreigners accused or convicted of a crime in Egypt to be deported to their home countries and be tried there, with the approval of the president. Speaking to Al-Jazeera in Cyprus, where he had stopped before heading home, Greste spoke of the mixed emotions he was feeling. "To be out now, today, with just a few minutes notice, really, is just extraordinary," he said. "But I also feel incredible angst about my colleagues, leaving them behind." He added: "You spend 400 days in such close proximity with people, and you really get to know them very, very well. So it was a very difficult moment walking out of that prison, saying goodbye to those guys, not knowing how much longer they will have to put up with this." Greste credited exercise, study and meditation as keys to his well-being inside prison. When asked what he looked forward to, he replied: "Watching a few sunsets. I haven't seen those at all for a very long time. Watching the stars; feeling the sand under my toes. The little things. "This has been like a rebirth, and you realize that it is those little beautiful moments of life that are really precious. And spending time with my family, of course, too." Greste was released following approval by Egyptian President Abdel-Fattah el-Sissi.